Fr. Rosica: Monsieur le Rector, thank you so much for welcoming us here at the Institut catholique de Paris. We are in the historic heart in Paris. You are the rector of the Catholic Institute, a priest from Nanterre, professor of moral theology, the canon of Notre-Dame Cathedral. We are here today because you were one of the experts at the Synod on the Family in 2015. We were there together. And I’d like to ask you about your experience at the Synod. It was, after all, a rather significant event. First of all, how were you chosen for this Synod, in what capacity, and what does it mean to be an expert at the Synod? Msgr. Bordeyne: It was a surprise for me. I was coming back from vacation, during the summer of 2015, and I received a letter from the Pope, telling me I was named as an expert. You’re right, I’m a professor in moral theology and for many years now, I’ve been teaching moral theology of the family. Of the family, of the family. It started when I was really young. I was ordained a priest in 1988. I was a chaplain of young people for 10 years, in colleges, universities, student chaplain in my diocese, and at that time, Professor Xavier Thévenot, who had been my teacher in moral theology fell ill, and very quickly asked me to become his assistant, to help him, and is allowed him to peacefully conclude his teaching career at the institute. It allowed me to continue studying and to teach a little while still working with young people. And so I quickly had to orient myself towards sexual and family morality. Then for 10 years I was responsible for the pastoral care of families and of marriage preparation in the diocese of Nanterre. I was eventually invited to speak in different countries… It was the main reason for the Pope’s decision. But it was still a surprise and an important event in my life. Let me ask you something. Many times, as a priest, who is celibate, and you become experts in the pastoral care of the family, what do you have to say to married couples? You are celibate. I was there, I remember how the Pope reformed the Synod of Bishops. What was your experience of the Synod in 2014, which was a preparation to the great Synod in which you participated? Very important. But I would say that even before that, at the beginning of 2014, the Pope celebrated baptisms, as his predecessors have done, on the Feast of the Baptism of the Lord, and that moved me. For someone who has been involved in family ministry, I usually welcome at baptism people that were married civilly, that are making that extra step in their faith journey, or single mothers, and to see that among those chosen for their children to be baptised by the Holy Father, there was a single mother, a civilly married couple who could still walk towards a religious marriage, it gladdened my heart, and it’s something that interested theologians. And it happened again just before the Synod last year in Saint Peter’s, where 27 couples, if I’m not mistaken, with many couples who had even lived together, to which there was strong criticism, “What is the Pope doing!”, why was his gesture important? Because the starting point was concrete. From there we raised the notion of divine pedagogy, which appeared at the 2014 Synod and which we explored with our colleagues, Canon lawyers, moral theologians, Biblical specialists, to ask ourselves what is, in fact, the pedagogy of God in Scripture, in the Bible? What is it? How does God deal with his people? And why, when the Pope wishes to revisit questions concerning the family 35 years after the last Synod on the family, why is he focusing on the way God works in men and women. That’s where we find the continuity. And that is the role of theologians at the 2014 Synod. Many Bishops are theologians. I noticed, in 2014, that the Italian Bishops were especially sensitive and creative with this idea of divine pedagogy, and so lots of work was done with catechesis, of bridging the gap between the experiences of families today, which isn’t what it was 50 years ago or 35 years ago, and very different if we’re in Asia, in Latin America, in Europe, in North America, in Oceania, in Africa… All these experiences are very diverse. In order to find clarity, we need to go back to Scripture, go back to the Church Fathers, and to see if what they passed down to us, what they discovered through Revelation, can illuminate today’s current situation. So this idea of divine pedagogy, had been mostly used by the Church Fathers to show how God could progressively bring the Gentiles to the faith. It’s the story of Christianity. Exactly. There are different positions. However, in the end, there was a document that was voted for by ? of the Synod Fathers and which contained a certain unity. It is our job as theologians, but we also got the input of students, many people in France are involved in family ministry, and were asking us so many questions. “What is going on at the Synod? Explain it to us.” And that was extremely motivating, as a moral theologian, to see so much interaction between the Synod of Bishops, with its own method, a first survey and then a second one, which was launched after the Synod in 2014, and to see so many groups emerge, people I hadn’t seen in so long would ask me, “We’re part of this group and this question came up, what do we do with, for example, the issue of baptising children of non-married couples, or the whole question regarding divorce, homosexuality, this is important. In France, we went through this whole situation of a law regarding marriage for all. There you go. And be able to talk. So I went to the Synod in 2015 with that memory. You had positive expectations, coming into this Synod, is it safe to say that? You worked a lot, I can testify to that as an eye witness. A very surprising thing! I’d like to focus on that. When I was looking at all the anglophone groups, and I got to yours, I thought this poor Frenchman, he got lost on his way here. I was tempted to say, you went through the wrong door. And you said, “No, I was in fact choose to the anglophone group”. How did this happen? Oh but I didn’t choose it. I was named to it, just like the bishops, I might add. Another surprise of the Synod. So I had simply indicated that the language I commonly use was French but that I could work in English. It is a miracle of the Synod. Exactly. But normally the cardinals from the Roman curia manage fairly well in English… So we were all there with our own weaknesses, the experts… and so I experienced… and for me, the francophones, I would have known them already, if I had been paired up with the French bishops whom I know well, the African bishops, I know many of them… This way, I discovered the whole world. I would even say I made new friends. Very strong. And there were many moments of gratitude at the end of the Synod. A bishop, with whom I didn’t always agree, told me, “I’ve been to many synods, this was my best group, and you weren’t there for nothing”. That made me happy. But it also means that fraternity is born in truth. And what I took with me from the Synod in 2014, what Cardinal André Vingt-Trois, who is the former chancellor of the Institut catholique, gave us the honour and joy of coming - he was co-presider at the Synod in 2014 and again in 2015 - and in 2014, he came to speak at the university. He explained to us how liberating it was, at the end of the Synod, to hear the Pope say you could speak freely, do not be afraid because, in any case, I will be making the decision. Do you think he was free? Ah, totally. Totally. Free like Christ was free. That is, oftentimes very silent. Above and beyond the division and the contrasting opinions, he was there. Accessible. I was able to talk to him. With coffee, like that… in an unexpected way. He was very attentive. When I met him, I explained to him what I was working on, and he understood it was a very difficult issue… so very attentive, free, because he kept an appropriate distance from the Synod. And he would lead us in prayer every day, very simply… a father and a brother and a leader. But always with the bishops! The experts were never left alone. You also had cardinals with you. Of course. Cardinals, the writing committee, and each language was respected, there was one Synod father and one expert attached to each language, and in each group treating the amendments, there were a minimum of eight people, and I was representing, each time, the French and the German, since there were hardly any Germans, so there was one German speaking group. After that, we held a discussion. For the writing committee, a discussion to receive the amendments, to respect their pertinence, respect the fact that the amendments could make us shift positions, because they came from someone of another culture, and at the same time, be concerned with, since the commission were named to create a document that would stand on its own, so naturally we had to follow the theme that was evidently emerging after listening to these three half days of reports on the general atmosphere of the Synod. What impressed me most was the initial reaction to the provisional text. Explain a little more. I remember that day very well. And that, really, I think that’s why each paragraph was agreed upon by ? of the voices. Everything was taken into consideration. And that moment, a very strong moment, in an assembly of more than 300 people, when we feel that it’s true. First, there was the work of the Holy Spirit. We weren’t very many and the task was great, and yes I worked day and night, so my strength was lessened… But to see that each person contributed his little stone, in a spirit of honesty and of listening to the directions which the Pope had given, we arrived at a place no one could have imagined beforehand. That is precisely my sentiment. I felt the Holy Spirit, its unity… It was that day, when we finally - there were a few voices, some differences, but everyone left that day thinking, yes this is ours. It is proof of the Holy Spirit. Yes. And now, we have to recognize that this text, in a surprising way, corresponds to what we are, but that we were unable to say before we experienced it. That for me was an extremely profound moment. Let’s speak now of Amoris Laetitia. The apostolic exhortation, a fruit of the Synod… Does the final document reflect what happened at the Synod, is it a key to understanding everything presented at the Synod? All that was done at the Synod, yes, and a little more. And a little more. We will speak about that little more. What struck you about the content found in Amoris Laetitia? Well, when we look at the book, there are chapters with many quotation marks. Astonishing. And it something new in the way of writing an Apostolic Exhortation, that it carries that many quotes from the final documents of both Synods. And so the Pope took the liberty of choosing from both Synods, more so from the 2015 Synod but also from the one in 2014. The Bible! Because it had been a criticism at the Synod, that there wasn’t enough biblical inspiration, and so the first chapter is biblical. And at the same time, there are chapters that are entirely from the hand of the Pope. It is a wonderful biblical panorama. Oh, what a wonderful chapter. I’m a Biblical Scholar and when I read it, I said to myself, here’s a manual for married couples and all those celebrating wedding anniversaries. It is a splendid exegesis. Yes I tell everyone to start with Chapter Four. Exactly. And we have to reread Evangelii Gaudium. They go together. Because everything which is said in Chapter Eight, on the integration of people, of the integration of fragile situations, in fact these words - I studied them very closely - come from Evangelii Gaudium. And so when the Pope talks about integration, it isn’t integration to validate, it’s not integrating to give ourselves points, it’s integrating so that every person can take on a missionary role in the Church. And so the Church truly goes out. Integrating is always linked to the Church which goes out. So we could believe that the goal of integration is so that we can create a little club, no! That’s what’s so paradoxical. The Pope says that we have to integrate to open up. That is really the movement of God. Since we’re talking about Chapter Eight. The most popular one in the exhortation. It was very much contested, some who say there was a lot of ambiguity, confusion; others received it with joy. In your opinion, what is at the heart of Chapter Eight? Why is it contested, discussed, open to questions? I believe it is discussed, open to questions, because the Pope highlights very important points of the moral tradition of the Church, which had been forgotten, which are rarely studied very much by theologians today, and which are very important to broach these questions. Which is the fruit of the Synod in 1980 on the family. With children, new obligations are born. Pope Francis... so, if we asked these people - the Church cannot ask them to separate, which would mean again breaking commitments made. In other words, I got divorced, I remarried, and 10 years down the road, of course there remains a rupture in the sacramental union, but since then I made new promises. And so we can’t erase that that part of our past. And John Paul II said this very clearly. Francis is saying it again and also says it very clearly. What’s new is that Pope Francis is extremely realistic, he likes the concrete - he says, at that moment, we cannot ask people to do the impossible. We can’t ask them to separate because this would be a mistake. What we will ask them, then, is build their future with God. And we will ask them to evaluate the quality of their new union. The Pope is very clear, he says we are not setting down a discernment on access to communion, on penance, when we have just remarried. It’s out of the question, he says this very distinctly. But once things have been established through time, we can regret the choices we made before. Many people, I’ve met a lot of them who told me, “If I had known, I would have never divorced.” You see? There are a number things we could have done in our life, but there comes a time when we have to be realistic. And Pope Francis’ realism, the Christian’s realism, it is to look at what God is doing in our life, so that where we see the irreversible we can still move forward. And the Pope says, that in the personal and pastoral discernment, these people will first have to look at what they are doing today to respond to God’s promptings, to God’s impossible promptings! Not to God’s call to stay faithful to the first union, it’s been dead for a long time, but to what he is inviting us to today. In this new union, with new children, how do I educate them, and in what way am I a model for others, a word from the Synod which the Pope uses? The virtue of faithfulness, I wasn’t able to fully put it into practice. But what about the other virtues, where am I at with those? I can be charitable, I can help my neighbour, and then we can let emerge - I see many families, meaning couples who are remarried, who care for children from both families, and who care for the elderly parents in both families, with parents suffering from Alzheimer’s, dementia, all the affection this demands - all these things are responses to God. The Pope says, instead of fixating on a past, look at what you need to do today. If I had to translate everything the Pope is saying, it would be, “Do all that you can but only what you can.” And sometimes we’re thrown off course when we try to do something which is impossible. He is so realistic, because he saying, what you must do today is what God is asking of you. He explains it, this is very much a text from the Pope, he says that way people will be able to acquire with sufficient conviction that they have done what they could to respond to God. He gives people a way which allows them to find their own worth, not in a glorified way, but because it is given by God. I believe one of the fruits of the Synod, found in Chapter Eight, is the whole question of conscience. It is a gift, in paragraph 37, if I’m not mistaken, this theme of conscience and the role of the Church in forming consciences. What are your thoughts on this? “We have been called to form consciences, not to replace them.” Just before that, we read something very important, conscience must discern what God is asking with our limitations. A word very important to Pope Francis. The faithful, they are the ones who are better placed to know what they must do with their limitations, since they are aware of their limitations more than anyone else. In other words, no one can know the extent of another person’s limitations. I have mine, you, Fr. Rosica, have yours, and our consciences is not only given to us to attain the ideal but also to discern all that is possible for us to do with the awareness of our limitations. For me what is new in the way it is being presented, the teaching is very well-known, everyone recognises that conscience is the new norm of morality. It is conscience which must guide our action and no one can put themselves in its place. This isn’t new. What is new is this expression, is to bring closer together the theme of conscience and the theme of limitations, a very contemporary idea, that psychology helps us understand how we can work within our limitations, but the Pope adds that grace is also at work in our limitations. And so enlightened by the Holy Spirit, another important theme, the baptised have received the Holy Spirit so that our conscience can discern the way of truth, the way that is suitable, all that is possible within our limitations. There is at once a realism but a real demand. That’s why the Pope has such strong words, to denounce the culture of waste, he says it about couples as well, so many couples today have lazily abandoned, because at first they felt loved and had positive feeling, and then all of a sudden, there are no longer positive emotions so we let them go. But he says, that’s going to be a real injustice, and our conscience is aware of it. Search your consciences. And then he goes on to give recipes, rather guides for life, to work on the negative emotions, and go find - there beautiful words which express this, if you haven’t yet discovered that pleasures change with age, you letting great joys pass you by. And we find there the theme of the joy of love. Conscience is given to us to go good but it also given to us to find the road to joy within our limitations. In paragraphs 36 and 37, what I find most important is that the ideal is always set against the concrete. And the conscience of the faithful is always set against their limitations. The Pope did talk about the three women, which you mentioned earlier: the sinful woman, the Samaritan, and the adulterous woman. I’m always struck by John 8, and Saint Augustine’s commentary… when his comment comes at the end, they are the only two left, the others have gone, they dropped their stories, Saint Augustine uses a beautiful Latin phrase, Relicti sunt duo: misera et Misericordia. How is this Synod, how is Amoris Laetitia, the expression of this mercy? And yet, you see so many people who can only see the misery, the difficulty, how was mercy present in this Synod, and in this document? I think in the way that the document considered our limitations, our hidden wounds. Our wounds, we can only look at them with sufficient serenity and with a loving gaze and a gaze that helps us grow. I told you at the beginning of our conversation, for 10 years I was in charge of adolescents. It challenges us, right? I was once a chaplain, I certainly understand. Finally, some have wondered why the Pope did not position himself clearly on the question of sacraments, on access to the sacraments. Why did he not say it’s possible or it’s not possible? There’s a note at the bottom of the page… Why do you think the Pope didn’t pronounce himself clearly on this question? I think he was clear, but he as clear as one can be when we propose a path of discernment in individual situations. If he had given a general word, he wouldn’t have been faithful to the tradition of the Church. In fact, Amoris Laetitia is not the sacramental discipline of our Orthodox brothers. Many Catholic theologians pleaded with the Roman Catholic Church to follow a bit… But this is not what the Synod wanted nor what the Pope wanted. And I think the Pope deeply respected - I don’t know what he thought about it before - but in any case, if he had gone down the Orthodox route, he wouldn’t have respected the Synod. Effectively, he is saying more than the Synod but he is saying it so that his words be a guide for real discernment. So he marks things out clearly, I said it earlier, he says right away that the period following remarriage is not the time to engage in that kind of discernment. I think this will be freeing for many pastors, for people hear things, “The Pope is making everything possible”, so there are times and moments… There are a certain number of criteria. I myself am involved, I will meet with priests, with consecrated persons, with the laity, pastoral councils in different regions. I see people are interested because it’s not simply ready to act. The Pope gives us food for thought, and food which is worthy and respectful of the work and of grace present among the faithful. I was involved for nearly 4 years, it was one of my favorite ministries. The bishop of Nanterre had given me the responsibility of adult catechesis. And, there you have it, those who prepare the lay people who accompany catechumens, it requires a great discernment. And as soon as the Church gives a criteria, has a conversion started to happen? I worked with groups for 4 years. It was difficult to know if there was a starting point. Was it sufficient? It’s always a risk. Discerning means taking a risk. If the Pope had said, “this is the way it’s going to be”, he would have prevented the Christian people from taking the risk it must take when he desires to listen to the Word given by God for each person’s life. My life, your life, it’s not the same. So it takes work, and we’re not living in the same culture, the Pope mentions this in paragraph 3 of Amoris Laetitia, so his words are clear but for some deceiving because he doesn’t draw a clear line. Rather, he says, let’s walk together, here are the criterias, and I am asking you to begin the journey. It is in part very clear but demands waiting, hoping, and getting to work. Monseigneur, Canon of Notre-Dame, Rector of the Institut catholique, Professor of Moral Theology, but also Father, pastor, chaplain, thank you from the bottom of my heart. Today I understood why the Pope named you an expert at the Synod, because you brought your pastoral and theological expertise, your intelligence, at a very crucial moment in the Church. Thank you and I hope this isn’t the last time that you join us on Salt and Light TV. Thank you. 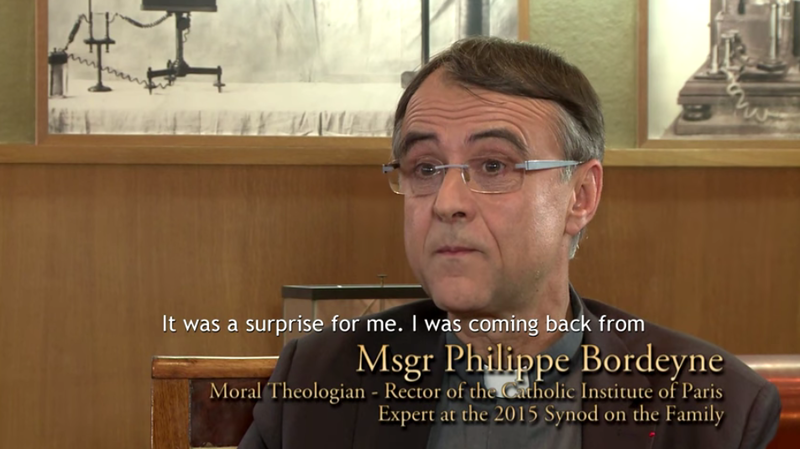 Yes, a big thank you to you as well, Father Rosica, you’re always welcome at the Institut catholique de Paris, and thank you for your availability. And thank you for fellowship. I didn’t get to tell you at the Synod, I’ll admit I was little lost in the beginning, and you were kind enough to encourage me and give me confidence, and that too is part of the life of the Synod.